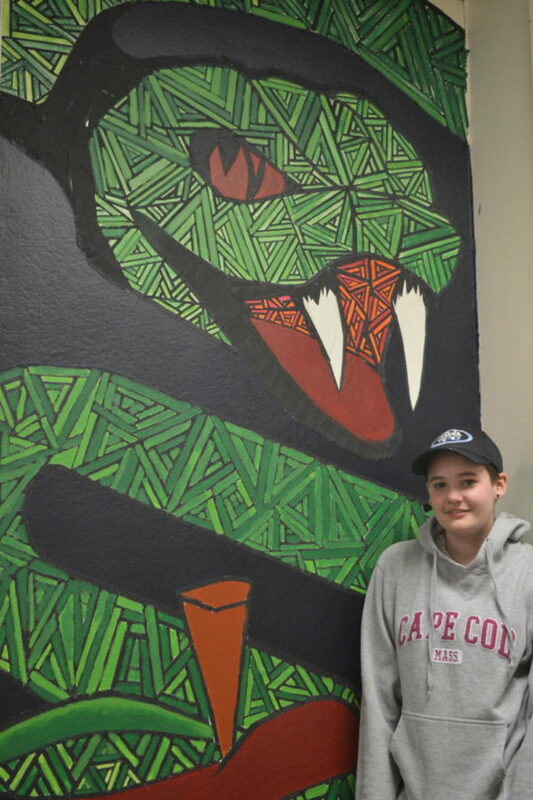 Picture perfect-- Junior Emma Fink poses in front of her serpent mural in the art wing. Fink has loved art ever since she was four years old, and prefers drawing and sketching. Ever since she was four years old, junior Emma Kate Fink has been consumed by art. Throughout her childhood, Fink used art both as entertainment and as an escape. As she has grown up, she has begun to appreciate the direct impact that art has had on her life and the world around her. “When I was younger, my little drawings helped me get through some of the roughest parts of my life. When the people around me were upset or unhappy and I didn’t know how to make it better, I found that I could always use my silly little cartoons to cheer them up. Obviously, I didn’t really understand it at the time, but using art to express feelings or thoughts that were just too hard to talk about [became a habit of mine],” Fink said. Fink admires the way that art unifies all cultures together throughout the world and throughout history. She finds it “beautiful” that art is the one thing that all people have in common. 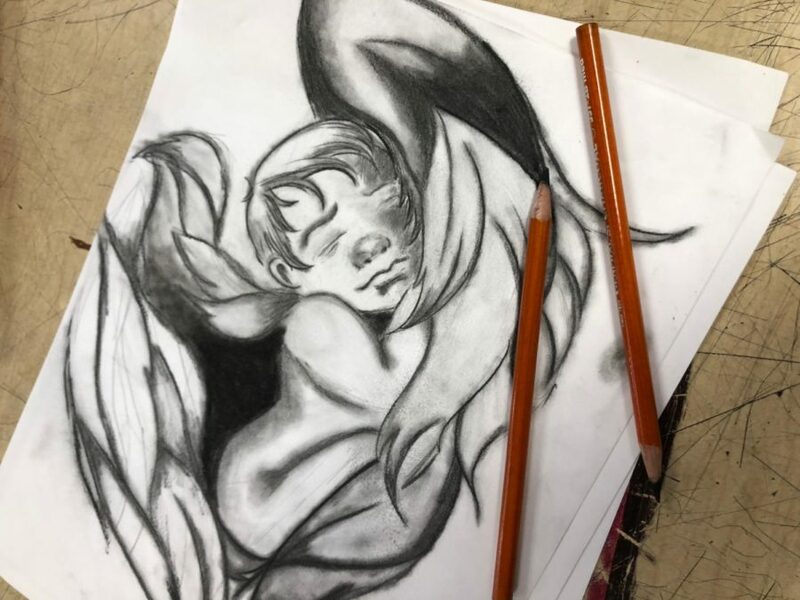 At the high school, Fink has taken Fashion Design, Ceramics, Photography, and this year, she is participating in the Crafts and Advanced Drawing classes to expand her artistic skills. Art teacher Katarina McKinney had Fink as a student when she took Fashion Design as a freshman and has enjoyed watching her grow both as an artist and as an individual. Senior David “Todd” Henry regularly sees Fink’s work through their shared love of art. He admires not only her talent for her art, but her passion as well. “Every time I hangout with her, she usually has a pen in her hand. I admire her work and her composition; it’s beautiful, and I hope I can learn from her. I hope that she continues with her art and seeks a career in art,” Henry said. One of Fink’s favorite pieces is her snake piece that is displayed in the stairwell going up to the art wing. She was originally assigned to a group task to create a mural; however, she felt that executing someone else’s artistic vision was not who she was as an artist. Her art also comes through in her academic classes. “I learned pretty quickly that what seems to be simple doodling is often Emma Kate’s communication of her learning. As her teacher, I look forward to seeing how she both expresses the content and herself through each and every piece,” English teacher MJ Martinez said. In the future, Fink plans to pursue a degree in fine arts at the University of Connecticut, though she is not sure of particular career yet. However, she hopes to pursue one that involves her passion for art as it has played a role in developing who she is as an individual today.